Bookmans Speedway has recently acquired a striking collection of Oaxacan Art. Oaxaca is the capitol and largest city in the Centro District in the Central Valleys region of Mexico where it sits in the foothills of the Sierra Madre at the base of the Cerro del Fortín. Oaxaca is famous for its fantastical and fanciful wooden figurines. The wildly colored, almost mythical animals are created by some of the most talented and skilled artisans in Mexico and are sought after collectors’ items. These carvings are called alebrijes and have become so popular that the Spanish Royal Academy included the term in its official dictionary. 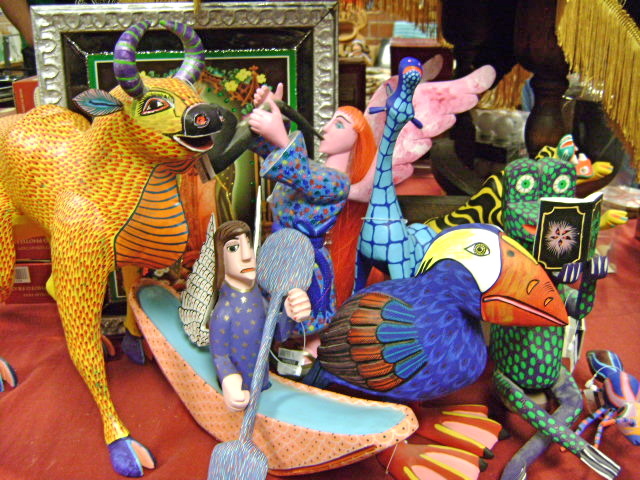 Alebrijes, or figuras “wooden figures” were imagined by Pedro Linares and originally made of paper mache. Today they are usually carved from the wood of a copalillo tree. Once the figurines are cut from the wood, they are left out in the sun to dry. Artisans then paint a bright base coat to which they imagine the complex and elaborate decorations. Often the figurines have removable parts such as ears or horns. The tools for such work vary and are only limited by the imagination of the artist. Tools such as toothpicks, leaves, sticks and knives are still used but traditional brushes are now often employed. Bookmans Speedway is fortunate to have purchased a range of creations. The collection is large and varies in size and price. The most striking element of the collection is its variety, with a riot of colors and imaginary animals. Don’t wait too long. These pieces go fast and are in high demand. Check out the collection today at Bookmans Speedway, where a new and exciting treasure is always waiting to be discovered.